We've got a special something for the movie buff in you! Introducing 'Dharma Movie Pass', your ticket to unlimited entertainment. Now, treat the movie enthusiast in you with an offering that is absolutely irresistible. Let's put an end to your curiosity and tell you how it works. Upto Rs 1200 Cashback on Movies. A Trip to Famous Dharma film Location. *User will get following things after purchasing the pass. 1. 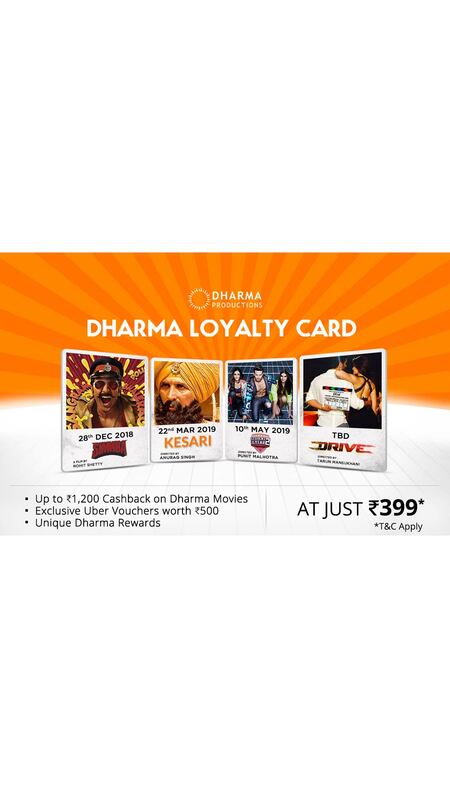 Up to Rs 1200 Cashback on Movies - Avail up to Rs 300 Cashback* on the next four Dharma movies. * Dharma Movie Pass' entitles the user for 4 movies after the purchase date. * Use your unique code to get 25% Cashback upto 300 on the ticket price of one movie ticket. * This offer is applicable on below selected movies. * 'Dharma Movie Pass' holder is entitled to watch a maximum of one movie a day and 4 movies after the purchase date. * The Dharma Movie Pass is Non-transferable and is to be used by the registered Paytm account holder. * Movie ticket booking realization is subject to availability. * The special Movie Pass code will be received post purchase Via SMS/Email. * Movie Pass code received is only applicable for booking movie tickets on Paytm web and Paytm App. * The Cashback will be credited in your Paytm wallet within 48 hours of booking movie tickets. * Convenience fees, 3D glasses or any applicable taxes will be charged additionally and is not a part of the offer under this campaign. 2. Uber Vouchers Worth Rs 500 - Make your next 10 Uber rides smoother with 50% discount. 3. Autographed Posters- Create memories of a lifetime with autographed posters for first few buyers. 4. Attend Exclusive Events- Get a chance to meet your favourite stars & attend exclusive events. 5. A Trip to famous Dharma film location- Make your dream trip to a reality with our exclusive contest. * Click on ''Your orders'' or Check Email/SMS for your Movie Pass code. * Click 'here' to use Movie Pass Code. * Visit here from web or Click here from app to avail the offer. * Select your preferred seat. * Apply coupon code at the time of checkout to avail cashback.